breaks a barrier we thought was beyond his reach. and House Minority Whip Steny H. Hoyer (Democrat-Maryland), right, during a meeting at the White House on Tuesday. — Photograph: Shawn Thew/European Pressphoto Agency/Agencia-EFE/Rex/Shutterstock. PRESIDENT TRUMP has broken 2,000. With just 10 days before he finishes his first year as president, Trump has made 2,001 false or misleading claims in 355 days, according to our database that analyzes, categorizes and tracks every suspect statement uttered by the president. That's an average of more than 5.6 claims a day. Under no scenario can the wall on the Mexican border be built in just one year. It's at least a four-year project that could cost $25 billion. Individuals apply for the visa system, and must have at least a high school diploma or work in specific industries to be eligible for the program. As the term “lottery” implies, applicants are selected via a randomized computer drawing. The selected applicants undergo a background check before entering the country, and some applicants undergo an additional in-depth review if they are considered a security risk. The wall will have virtually no effect on drugs coming into the country. According to reports by the Drug Enforcement Administration, the majority of drugs are smuggled through legal ports of entry or underground tunnels. Trump's claim about drug smuggling and the wall has been repeated 17 times, even though we awarded him Four Pinocchios. In just two months, he's falsely described the diversity lottery 12 times. And of course building the wall was a signature issue from the beginning of his presidential campaign, when he consistently low balled the cost. We currently have a tie for Trump's most repeated claims, both made 61 times. Both of these claims date from the start of Trump's presidency and to a large extent have faded as talking points. One of these claims was some variation of the statement that the Affordable Care Act is dying and “essentially dead”. The Congressional Budget Office has said that the Obamacare exchanges, despite well-documented issues, are not imploding and are expected to remain stable for the foreseeable future. Indeed, healthy enrollment for the coming year has surprised health-care experts. Trump used to say this a lot, but he's quieted down since his efforts to repeal the law flopped. Trump also repeatedly takes credit for events or business decisions that happened before he took the oath of office — or had even been elected. Sixty-one times, he has touted that he secured business investments and job announcements that had been previously announced and could easily be found with a Google search. With the successful push in Congress to pass a tax plan, two of Trump's favorite talking points about taxes — that the tax plan will be the biggest tax cut in U.S. history and that the United States is one of the highest-taxed nations — have rapidly moved up the list. Trump repeated the falsehood about having the biggest tax cut 55 times, even though Treasury Department data shows it would rank eighth. And 59 times Trump has claimed that the United States pays the highest corporate taxes (26 times) or that it is one of the highest-taxed nations (33 times). The latter is false; the former is misleading, as the effective U.S. corporate tax rate (what companies end up paying after deductions and benefits) ends up being lower than the statutory tax rate. We also track the president's flip-flops on our list, as they are so glaring. He spent the 2016 campaign telling supporters that the unemployment rate was really 42 percent and the official statistics were phony; now, on 47 occasions he has hailed the lowest unemployment rate in 17 years. It was already very low when he was elected — 4.6 percent, the lowest in a decade — so his failure to acknowledge that is misleading. An astonishing 91 times, Trump has celebrated a rise in the stock market — even though in the campaign he repeatedly said it was a “bubble” that was ready to crash as soon as the Federal Reserve started raising interest rates. Well, the Fed has raised rates four times since the election — and yet the stock market has not plunged as Trump predicted. It has continued a rise in stock prices that began under President Barack Obama in 2009. Again, Trump has never explained his shift in position on the stock market, making his consistent cheerleading misleading. Moreover, the U.S. stock market rise in 2017 was not unique and mirrored a global rise in equities. When looking at the Standard & Poor's 500-stock index, it's clear U.S. stocks haven't rallied as robustly as their foreign equivalents. The percentage gain in the S&P 500 during Obama's first year still tops Trump's numbers — though any president bragging about stock market performance soon finds out it's a fool's game. • Glenn Kessler has reported on domestic and foreign policy for more than three decades at The Washington Post. He would like your help in keeping an eye on public figures. Send him statements to fact check by tweeting at him, or sending him a message on Facebook. • Meg Kelly produces video for the Fact Checker at The Washington Post. Culture of dishonesty pervaded the White House, with officials routinely mangling truth to serve Trump. Sarah Huckabee Sanders says she mis-spoke when she insisted in 2017 that “countless” FBI agents were grateful to see Director James B. Comey fired. Dishonesty has been common from this White House. — Photograph: Chip Somodevilla/Getty Images. WASHINGTON D.C. — Addressing reporters from the White House lectern, then-Deputy Press Secretary Sarah Huckabee Sanders made a startling claim shortly after President Trump fired FBI Director James B. Comey two years ago. “I’ve heard from countless members of the FBI that are grateful and thankful for the president’s decision,” she said, refusing to back down when pressed on the issue. “Between emails, text messages, absolutely,” she insisted. It's a crime to lie to federal investigators or Congress, a lesson that many of Trump's associates found out the hard way. (Just ask former national security advisor Michael Flynn or disbarred lawyer Michael Cohen; they're among several who pleaded guilty.) But it's not a crime to lie to reporters and the American people, and for that the president's team can be grateful. The redacted 448-page Mueller report, released on Thursday, exposed in voluminous detail how the Trump White House is comfortable not only spinning the truth, but outright demolishing it. Sometimes the president did the lying himself. Sometimes he had others lie for him. And sometimes people lied because they thought it was required of them. Sanders refused to back down on Friday when questioned on ABC News. She insisted that she had mis-spoken about “countless” FBI agents “in the heat of the moment,” even though she repeated the claim multiple times. Not everyone around Trump has been willing to lie on his behalf. After a March 22, 2017, Oval Office meeting, the president asked Director of National Intelligence Dan Coats to say publicly that Trump didn't have any links to Russia, the report said. The claim would have been false, since Trump sought to build a luxury skyscraper in Moscow while running for president. Coats declined, telling Trump “it was not his role to make a public statement on the Russia investigation,” according to the report. Others also pushed back. When Trump fired Comey on May 9, 2017, he asked Deputy Attorney General Rod Rosenstein to hold a news conference. “Rosenstein responded that this was not a good idea because if the press asked him, he would tell the truth that Comey's firing was not his idea,” the report said. But the report showed numerous others were willing to spread falsehoods on Trump's behalf. After the president fired Comey, the White House issued a statement saying that Trump had acted on a recommendation from the Justice Department. But Trump had previously decided to sack Comey. Reince Priebus, then chief of staff, told investigators he believed the president personally dictated the misleading statement recommending the firing. Days later, when Mueller was appointed special counsel, White House officials told reporters that Trump was undisturbed by the development. In fact, he was devastated. “This is terrible. This is the end of my presidency,” he said, according to notes taken by an aide. Trump sometimes lied to his own aides. One episode involved a resignation letter prepared by Jeff Sessions, then the attorney general, who had infuriated Trump by recusing himself from supervising the Russia investigation. The president decided not to push out Sessions at the time, but he took the letter with him on a trip to the Middle East, showing it to senior advisors aboard Air Force One. Priebus was concerned that the president planned to use the letter as leverage over Sessions, and he asked about it during the trip. Trump falsely said the document was back in his White House residence. Later that year, Trump tried to prevent the truth from coming out about senior campaign officials' June 9, 2016, meeting at Trump Tower with a Kremlin-connected lawyer. The president “directed aides not to publicly disclose the emails,” the report said. When the meeting was revealed by The New York Times on July 8, 2017, Trump edited a public statement to conceal crucial details. He removed a line admitting the meeting involved someone who “might have information helpful to the campaign,” and he claimed that participants talked about the adoption of Russian children. The statement was issued under Trump Jr.'s name. The embarrassing emails soon leaked, contradicting the statement dictated by the president, but the lies continued. “Over the next several days, the president's personal counsel repeatedly and inaccurately denied that the president played any role in drafting Trump Jr.'s statement,” the report said. Once the president's role was revealed, he downplayed the importance of being honest with the public. “It's a statement to The New York Times…. That's not a statement to a high tribunal of judges,” Trump told reporters. Pervasive lying is an unsurprising result of having a president whose dishonesty has been a hallmark for years, whether it's exaggerating the height of his buildings or claiming that President Obama wasn't born in the United States. While every administration is accused of dissembling or worse at times, the report makes clear that Trump leads a White House where falsehoods and misrepresentations are common practice. When a Washington Post columnist reported on January 9, 2017, that Flynn may have discussed sanctions with the Russian ambassador during the presidential transition — contradicting what Flynn had told other administration officials — Trump was furious. “What the hell is this all about?” Trump asked Priebus, who told Flynn that Trump was unhappy. Flynn then asked his deputy, K.T. McFarland, to help “kill the story,” the report said. McFarland called the columnist and denied that Flynn and the Russian ambassador had talked about sanctions, even though she “knew she was providing false information,” according to the report. Flynn was forced out of the administration about three weeks after Trump's inauguration. He has pleaded guilty to lying to federal agents, and he's awaiting sentencing as he cooperates with another investigation involving his business associates and undisclosed Turkish lobbying. Mueller's report includes new details on how Cohen prepared his false congressional testimony about plans for a Trump Tower in Moscow. During those months in 2017, Cohen was in a joint defense agreement with Trump, and he discussed his upcoming testimony with the president's legal team. Cohen said the lawyer, who was not named, told him “the president loves you” and would have his back if he stayed on message. Unless Cohen “went rogue,” he would be protected, according to the report. A draft of Cohen's testimony was circulated among members of the joint defense agreement, and a key line about “limited contacts with Russian government officials” was deleted. Cohen had, in fact, spoken with a Kremlin office about the proposal. The testimony also included the falsehood that work on the proposal ended in January 2016 rather than several months later, after Trump had secured the Republican presidential nomination. Cohen told prosecutors he wanted to adhere to the “party line” by downplaying Trump's ties to Russia, according to the report. He's been sentenced to three years in prison for lying to Congress and several other crimes, and he's scheduled to report to prison on May 6. They were part of a “script,” Cohen told prosecutors, that he developed with others — including the president himself. • Chris Megerian is based in Washington, D.C., where he writes about the special counsel investigation for the Los Angeles Times. He previously covered the 2016 presidential campaign and the 2015 United Nations summit on global warming in Paris. As a reporter in Sacramento, he has also written about Governor Jerry Brown, climate change policies, California politics and state finances. Before joining the Los Angeles Times in January 2012, he spent three years covering politics and law enforcement at the Star-Ledger in New Jersey. He grew up in Massachusetts and graduated from Emory University in Atlanta. White House reporters have a few ideas. may be permanently damaged as Trump's spokewoman. Sarah Sanders talks to reporters outside the White House. — Photograph: Bill O'Leary/The Washington Post. 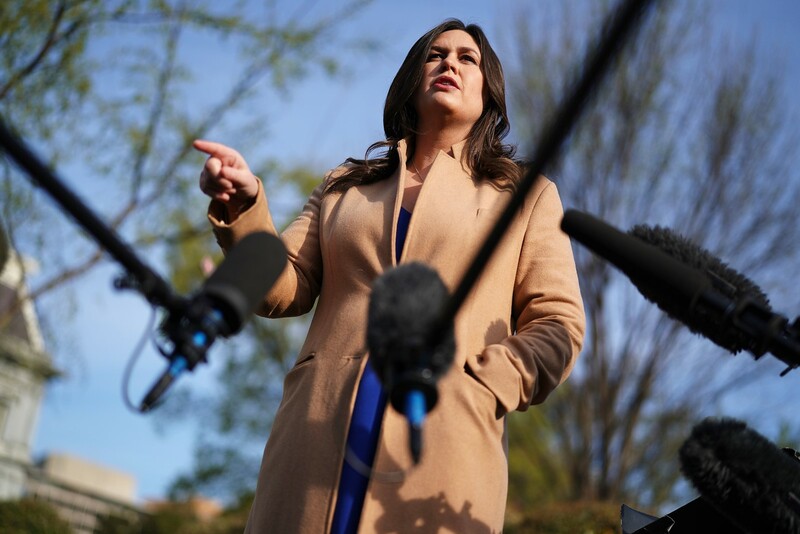 But with the publication of special counsel Robert S. Mueller III's report on Thursday, Sanders's credibility among the people who cover her has been stretched about as taut as a violin string. One White House reporter, April Ryan, has openly called for Sanders to be fired. While others don't go that far, they acknowledge that Sanders's public statements have damaged her, perhaps permanently, as the president's spokeswoman. In conversations with reporters, it's not unusual to hear her compared unfavorably to Ron Ziegler, President Nixon's press secretary, whose reputation was shredded by the Watergate scandal. Sanders admitted under oath to Mueller's investigators that she made a series of false statements to the press after Trump fired FBI Director James B. Comey in May 2017. Sanders told Mueller that her comment that “countless” FBI employees had told her they supported the president's decision was “a slip of the tongue”. She also said a second utterance — in which she said asserted that Trump and “the rest of the FBI” had lost confidence in Comey — was made “in the heat of the moment”. Mueller’s report concluded that her comments were “not founded on anything”. Given that she made the erroneous statements on two separate occasions, her explanations for them raised the possibility that she not only lied, but lied in explaining why she lied. To some extent, Sanders's credibility is a moot point among reporters, given her increasing isolation from and limited contacts with the press. Under Sander's tenure, formal press briefings have all but disappeared, relieving Sanders of what was, at least in previous administrations, the press secretary's primary daily responsibility. As of Tuesday, the Trump White House will set a record for the longest stretch without a briefing, 43 days. This breaks the previous record set in March (42 days), which broke the record set in January (41 days). Since the beginning of the year, Sanders has had just two briefings, fielding press questions for a mere 30 minutes or so in total. Sanders sometimes holds Q&As with reporters on the White House driveway outside the James S. Brady Press Briefing Room. But these are both informal and irregular. She has also become well known among reporters for not responding to emails or calls to her office seeking comment. Sanders did not reply to a request for comment for this story. One reporter points out that Sanders can be helpful in the limited times she does engage, but not in a way that the public — or the president — sees. Sanders still has access to the president and can be a useful source on background or off the record, said the reporter. “She won't deny things that she knows to be true,” said the reporter, who spoke on the condition of anonymity because her employer hadn't approved her speaking for publication. • Paul Farhi started at The Washington Post in 1988 and has been a financial reporter, a political reporter and a Style reporter. Since 2010, he has covered the news media for Style and is a three-time winner of National Press Club award for media reporting and criticism.